Rouge Allure Luminous Intense Lipstick - The next generation of Rouge Allure dresses lips with unmistakable attitude. A new formula with concentrated, ultra-thin pigments offers radically intense colour with full coverage and a satin finish. Leaves lips supple and protected with lasting comfort. 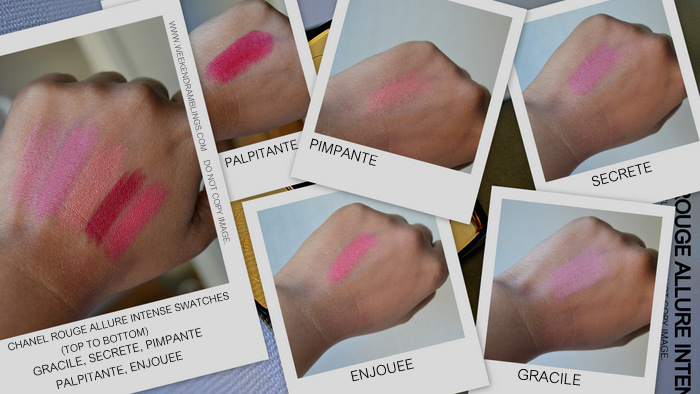 I did my best to get the colors properly but am not really satisfied with some of the swatches, especially Gracile. The actual color is more like that in the first photo with all the colors together. I need Rouge Noir in my life right now, I havent seen any swatches of that color other than the photos on the Chanel website... and 5 more, im really liking Enjouee, Gracille and Secrete! Awesome swatches, will check these out as soon as they hit the counters.